A big part of our job as children's ministry leaders is to influence the primary influencers of children...which is their parents. Cell phones are a great tool for families. It can help them stay connected, keep a closer tab on where their children are, provide quick access to information and much more. But cell phones can also dominate families' time and attention if they are not intentional about how and when they use them. A recent survey revealed that parents use 9 hours and 22 minutes of screen time each day (computers, TV, smartphones, tablets, etc.). Out of this total time, only an hour and 39 minutes is work-related. I wonder how much of the remaining 7 hours and 43 minutes is time parents are looking into a screen when they could be looking into the face of their children? How much of the time is parents interacting with their phone instead of interacting with their children? 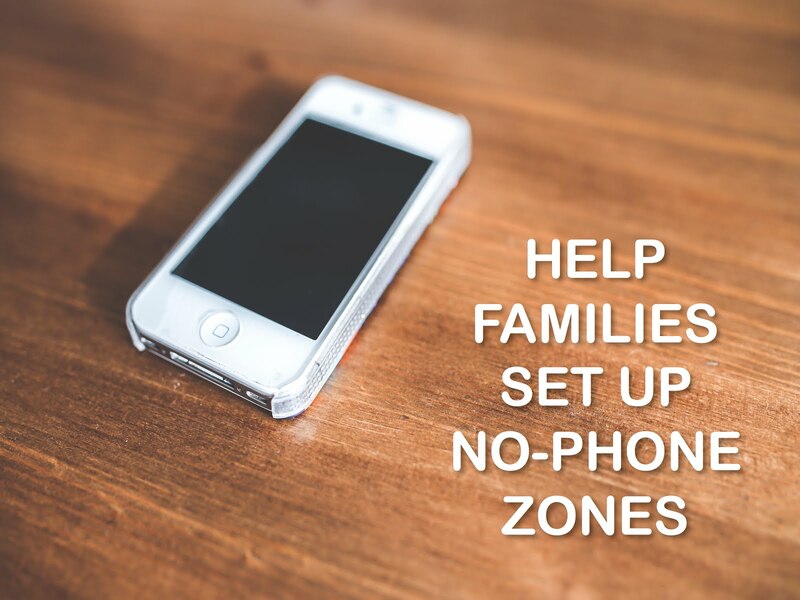 One way you can equip parents is by encouraging them to set up "no-phone zones." These are spaces where families agree that everyone will put down their phone and spend time connecting directly with each other. Here are 5 no-phone zones you can share with parents. And for this to be effective, parents will have to lead by example. 1. Bed zone. Encourage parents and kids to set down their phones when it's bedtime. There is something special about the time when parents are putting their children to bed for the night. It is such a great time for parents to talk with their children, pray with their children, read a Bible story with their children, etc. 2. Meal zone. Don't invite digital devices as guests to the table during meal time. Meal time is a great time to have face-to-face conversations and bond as a family. 3. Outside zone. Encourage parents to get out and enjoy the great outdoors with their children without digital distractions. Enjoy parks and playground uninterrupted. 4. Travel zone. This can be a challenge, especially on long trips. But help parents keep in mind that the car can be a great place for important conversations to take place. This is especially true at times like the ride home after school. 5. Holiday zone. Holidays are one of the key times when parents can make memories with their children. Help them see how important it is to not let their phones cause them to miss the moment. Many times parents feel the pressure to capture every moment so they can share it with family and friends on Facebook or Instagram. There's nothing wrong with sharing family moments on social media, unless it becomes more important than enjoying the family moment itself. There is nothing on a phone that is more important than parents spending time with their children face-to-face and investing in them by truly being in the moment with them.